Revered playwright and Nobel laureate, Prof. Wole Soyinka, says he will hold a private funeral on January 20 when United States President-elect, Donald Trump, is inaugurated as President. 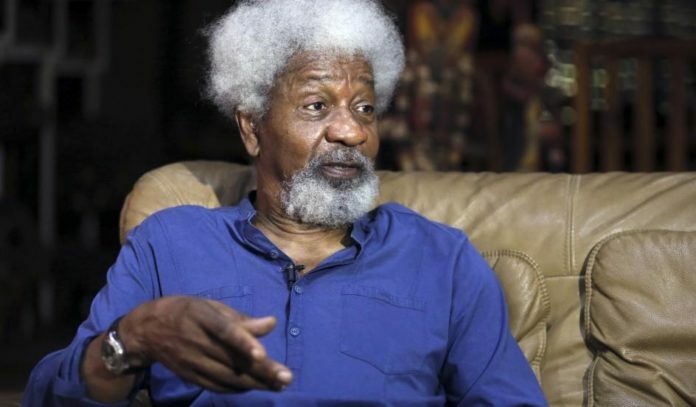 Soyinka, who spoke in Lagos on Monday, explained that the funeral is not to mourn with the citizens of the US over their choice of president but to mourn the death of Nigeria’s common sense. He also said Nigerians did not have the right to query his personal decision to tear his US green card. Soyinka, continue to dance Unclad in the world scene and keep humiliating yourself the world over. You have now become a serial wanderer, moving from one country to another and dictating for them on how they run their affairs. I think this guy is sick and needs psychiatric help. He claims he tore his recoverable green card. Now he wants to conduct his own burial while still alive. He has gone beyond tipping point. I hope this is not one of his unserious drama. what of others business he has put his mouth uninvited? This man should respect his old age and keep quiet. Who has read the book Our Husband Has Gone Mad Again by Ola Rotimi? Soyinka, please continue with your way of life, the way you have amaze us is strange, if you can criticise a once presidential aspirant of a nation based on his opinion and in turn you get criticise for own comment; then why must you result to abuse of your Nation sense of reasoning. You see you are a role model but your words should be guided so that people can always reference you as someone who has good professional etiquette. Easy please. Learn how to respect an elder. Yes o Prof, the right thinking people of the world stand by you. I hope we won't pay to watch it. Soyinka, that is how I feel about being a Nigerian too, many times. Having to share the same nationality and nation space with some people is just cringing and heart rending. See the kind of comments one reads on this forum as an example. We are completely lost, with no iota of common sense or spirituality or any hope of regaining it. But no problem, Jesus is coming on or before the 20th of January 2017. The Great Resetter has come! Sometimes silence is golden, so prof should respect himself and stop insulting our collective intelligence, after all no one put a gun to his head when he was making the unguarded statement he made. Enough said! Old man's misplaced priorities...Buhari is seriously dealing with us here and you are talking about Trump who doesn't give a sh1t about immigrants like yourself. If it was about Nigeria being lost, then why wait for Trumps inauguration? this man is now sounding stupid.... u dn fall your hand...Trump no even know u..
Diss Soyinka all u want. He has achieved. Hes not the one that said u guys shld be cutting each other with machete cuz of cultism. There r frats in other countries who 3l3vat3 one another. Come here and insult someone who has don3 things you wont achieve even if u had 9 lives. Hes right. This cultist again? The number of youths you destroyed (yet to be destroyed) with the cult you brought into this country is so alarming. Others bring developments, you brought cult to ravage our youth. Even the so called Trump you are hating on is saving jobs already before his inugauration. You supported and encouraged many to support a terrorist/Dullard and you think you wont share in the punishment? This is just the beginning, by the time the economy deals you its blow, bro you will join MMM by fire by force. Uncle Cultist, the earlier you make public denunciation of your membership, thereby encouraging our youths to shun cultism the better for you. Your invention has destroyed our youths and its a shame for a person of your caliber . This man is beginning to talk anyhow. Oga face your book and leave politics for those that know what they're saying. LMAO. Dude has officially lost it.